The South Fork attracts thousands of rafters every summer, but is also host to a lively kayak community. Locals jump in inner tubes to cool off on blazing summer days. The small towns of Coloma and Lotus have food, entertainment, and places to crash as well as a gear shop for anything you forgot on the kitchen table. The South Fork’s whitewater may not be the gnarliest or the most spectacular in the state, but it is the most popular for a good reason. With an ideal location less than an hour east of Sacramento, the American River is nestled into California’s beautiful oak-covered foothills and runs right through Coloma, the town where gold was discovered. The Upper section starts off with a rush as you drop into Meatgrinder, one of the longest rapids of the day. And Troublemaker, with its powerful right-hand turn and powerful hydraulics always brings a smile-which is good because of the crowds of photographers and sunbathers on the riverbanks. 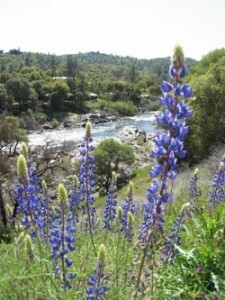 The Upper’s scenery is pure California, with golden grasses, tall oak trees, and stands of pine and cotton wood. In the spring, Mt Murphy is carpeted in a fantastic display of flaming California Poppies. In the springtime, when the weather first begins to warm up, California’s state flower, the Poppy, blooms in abundance along the hillsides of the Chili Bar section. The Class II section of the South Fork (C to G) is a gentle float trip, but tenacious kayakers find plenty of play spots along the way as well. The most popular spot is Barking Dog rapid, just downstream of Camp Lotus. 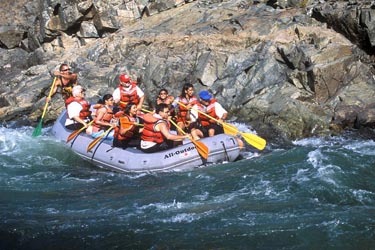 The Lower also has lots of fun class III rapids, starting with Fowler’s Rock–a notorious wrap rock. Other rapids include Satan’s Cesspool and Bouncing Rock. The scenery on the lower is lovely and slightly more open than the canyon on the Upper. Popular sights include the Lollipop tree and Gorilla Rock. You will also see Merganser ducks, birds soaring overhead, and a rich riparian environment.